MONTREAL, April 8, 2019 /CNW Telbec/ - Air Canada today launched an expansive multi-media advertising campaign to showcase for customers the industry leading attributes and benefits of its award-winning, North America Business Class service and its commitment to customer service excellence. The campaign is set to run until June 2, including a three-week television component starting today to coincide with the beginning of the NHL playoffs. "Air Canada's North America Business Class offers customers unmatched services and amenities that deliver on and even anticipate their expectations. 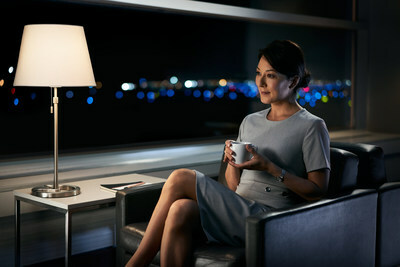 This campaign will reinforce how our employees strive to earn our customers' loyalty each day by providing a superior travel experience through customer service excellence, while also highlighting the very real benefits to their businesses of choosing Air Canada Business Class," said Andrew Shibata, Managing Director of Brand at Air Canada. "The superiority of Air Canada's Business Class has been recognized by numerous industry awards and confirmed by the 2018 Ipsos Reid Canadian Business Traveller Survey, which found Air Canada is the preferred airline for domestic travel for 92 per cent of frequent business travellers. Our unrivalled Business Class service is a key reason why Air Canada has been named the Best Airline in North America at the Skytrax World Airline Awards for seven of the last nine years, including in 2017 and 2018, when it also won the Skytrax Best Business Class in North America." The campaign, centred on the concept of "We're in the business of you", will feature one 60-second and two 15-second television spots, which can be viewed on YouTube (see links below). These will be supported by airport and arena out-of-home placements and extensive digital, print, social media (Facebook, Instagram, Twitter and LinkedIn), and other sales communications. The campaign was developed in partnership with FCB Montreal.